Also called “earthing”, walking barefoot is proven to add to your health in very many ways. For example, did you know barefoot walking reduces inflammation and improves sleep? 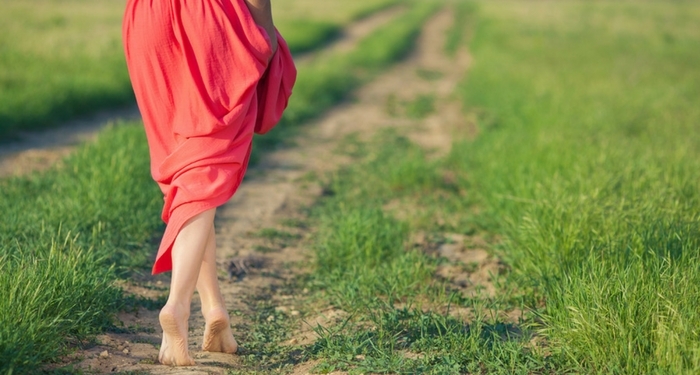 Earthing or walking barefoot means walking on soil, grass or sand or any natural surface. Studies show that earth has its own natural charge because of electrons on the earth. Feet draws electrons from the earth and improves our health. Walking barefoot changes the electrical activity in the brain. It benefits skin conductivity, moderates heart rate variability, improves glucose regulation, reduces stress and boosts immunity. As earthing increases the surface charge of red blood cells they do not clump that lessens blood viscosity. High viscosity leads to heart condition, which is why doctors prescribe blood thinning aspirin to counter this condition. Regular barefoot walking for at least half an hour a day reduces cancer risk, improves cardiovascular health, moderates weight and prevents diabetes. Barefoot walking improves blood oxygenation, circulation, and immune response, removes toxins and relieves stress. Studies confirm that earthing helps regulate both the endocrine and nervous systems too. Walking outdoors in a natural environment, breathing fresh oxygen-rich air while enjoying the scenic beauty of Nature adds to our health and well being in very many ways. Prakruti Farms gives you vast stretches of grass, sand and soil to indulge in bare foot walking. It is a precious gift you can gift your children, in particular, with. Walking barefoot betters immunity of both children and adults alike. Allow your children walk around in sand, ground, muddy road and small rocks in Prakruti Farms. It improves their immunity levels. Walking barefoot stimulates pressure points on their feet. It not only strengthens their body but also turns them very active. Damaged cells cause inflammation leading to cancer, heart diseases, aging and many other problems. Walking barefoot brings down inflammation, strengthens your legs, body and makes you active by increasing your energy levels. WHAT MORE DO YOU GET OUT OF BAREFOOT WALKING? Barefoot walking generally cause physical and emotional rhythms. As we walk, our breathing synchronizes with our motion. We begin to experience a sense of expansion and freedom. Walking barefoot gradually becomes a form of healing rather than just an exercise. It removes our stress and replaces it with well being at every level. Even a light stroll leads to release of endorphins. When our bare skin comes in contact with the earth, the negative ions present in the earth helps to balance the positive ions in our body. Bare foot walking helps bring sleeplessness (insomnia) under control. An adult requires a minimum of seven hours of sleep to stay healthy. Barefoot walking on grass cures insomnia. Walking barefoot stimulates acupuncture points of the foot, which, in turn, helps in stimulating the nerves and veins. This improves the nervous system of our body. As there is a pressure point on the foot that connects with the nerves of the eye, walking barefoot on the grass stimulates your eyesight. Walking barefoot improves our nervous system and improves blood circulation too. Improved blood circulation improves cardiovascular system. Barefoot walking brings down hormonal and menstrual symptoms. Hormonal imbalances lead to several mental and physical problems. Premenstrual syndrome in women causes mood-swings, stomach aches, headaches, gain in weight, constipation, acne and few other symptoms. Walking barefoot helps bring down these conditions. As nerves of the feet are stimulated when we walk barefoot, our stress levels come down when we walk barefoot on the ground. And when stress gets released, blood pressure gets controlled too. As our body absorbs electrons from earth when we walk bare foot, oxygen levels increase in our body lowering acute chronicle pains we suffer from. Walking barefoot not only strengthens your feet, ankles, cure chronic pains, inflammation, insomnia and improves nervous system, eye-sight, immune system, controls blood pressure, hormonal imbalance but also improves posture, relieve anxiety, stress, depression, protects body from electromagnetic fields, slows down aging and helps in healing injuries faster. Walking barefoot improves both your mental and physical health. Prakruti Farms is the ideal place for bare foot walking for the whole family. Make it a part of your life and improve the quality of your life.